Tonight I attended a meeting of the board of DCA. There was a really interesting presentation on DCA's marketing strategy. The current exhibition at the DCA by Jane & Louise Wilson is well worth a visit. There is always a lot going on in the DCA and it is well worth a visit. There is a lot of work going on to encourage people to visit the DCA. On Wednesday I was at a meeting of Sport Dundee, Dundee's sports council. This meeting heard about a lot of good work going on in sports clubs across the city. I was pleased to hear that the education department is happy to look at ways of ensuring that sports facilities in schools are used more for the community outside school hours. On Wednesday I attended the latest meeting of the Scrutiny Committee. There were a number of interesting reports put before the committee. I asked about self-evaluation in schools. I have noticed that this is an issue that comes up a lot in HMI reports on schools. I was told that this was an issue right across the country and that the Education Department was working on this issue across all of Dundee's schools. I asked about problems in dealing with noise nuisance. I was concerned to hear that staffing problems had led to problems in dealing timeously with this issue. I sought an assurance that this problem would be solved. There was a report on the risks posed by asbestos in the council's properties. I was pleased to be given an assurance that the council is confident that it knows where asbestos is present in its buildings. Just to prove that romance is not dead on St Valentine's Day I attended the February meeting of the West End Community Council. 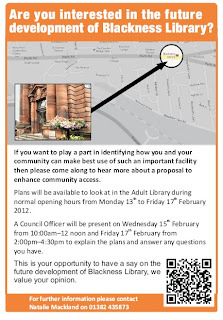 The meeting heard a presentation on ADAPT which is a project based in the Citizen's Advice Bureau in Dundee. ADAPT stands for Avoid Debt Act Positively Today, this project looks at ways of helping those who have difficulty in dealing with financial matters. We also heard from the local community police about the issues facing the West End just now. There was a presentation about the proposals to improve Blackness Library with a lift, a new staircase and new toilet facilities and the consultation on these proposals. Since my time as Convener of Leisure, Arts and Communities I have been keen to see improvements at Blackness Library. There are proposals now to add a lift, a new staircase and some new toilet facilities at Blackness Library. These changes would allow disabled access to the upper floor at the library. They would also allow for community access to the upper floor independently of whether the library is open or not. There is a consultation going on just now, anyone who is interested in the future of the library should make the effort to get to the library during normal opening hours until Friday. 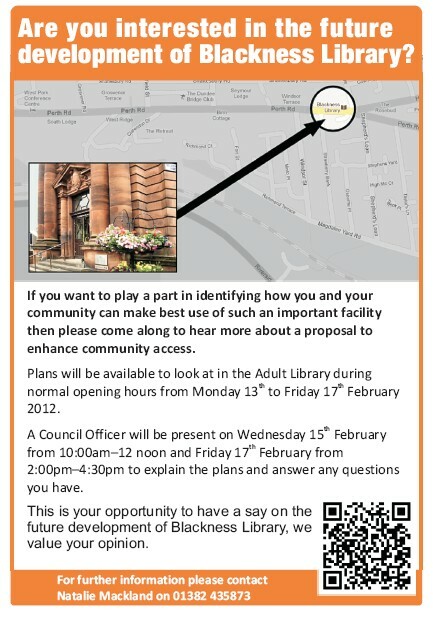 There will be an exhibition of the proposals at the library during these times. On Wednesday morning between 10am and 12 noon and Friday afternoon from 2pm until 4.30 pm there will also be a council officer present who will be able to explain the plans and also take note of any issues which are raised. I think that these proposals are good. There are a few issues which have been raised with me such as the light and the heat in the rooms on the first floor and I will be raising these with the council. At the Environment Committee on Monday I raised a number of questions. I sought more details on a number of tender processes. I was concerned that there was not enough detail in the reports about Land Service plant, the recycling of recovered materials and the supply of electric charging points. I also asked about the progress being made at Caird Park Velodrome, I welcome the investment in the velodrome I see this as part of the Olympic and Commonwealth Games legacy. I also asked for an update on the progress of allowing the cycling community in Dundee to have a say in the running of the velodrome. At the Policy and Resources Committee there were a number of interesting reports. I supported my colleague Kevin Keenan in calling for more information about the compulsory purchase order proposed for Dundee Waterfront. I share Kevin Keenan's concern that as elected representatives we have to be certain that we are using public money appropriately. In terms of the information in front of us today I just do not think that we could be certain that this was value for money. Labour opposed sending councillors to the CIPFA Conference at the Caird Hall. Sending councillors to this event costs £395. I just do not see how this represents value for money. I do not know how the council can make cuts as it did last Thursday and then say that councillors should be sent to these incredibly expensive events. I think that the council should really be trying to join with other councils to tell organisations which run conferences like this that the costs of these conferences are ridiculous. As the Convener of the Dundee Fairtrade Forum I welcome moves by Dundee City Council to update its policy with regard to Fairtrade (see pages 68-70). I would like to praise the work of my predecessor as Convener of the Fairtrade Forum, Ann Gammack, who has campaigned tirelessly to achieve a stronger commitment to Fairtrade from the Council. I warmly welcome this report which meets many of the objectives of the Fairtrade Forum. I would like to pay tribute to my predecessor as Convener of the Fairtrade Forum, Ann Gammack, who along with others has worked tirelessly campaigning for the council to serve only Fairtrade. Ethical procurement should be something that is at the heart of what we do as a council. Whether it is ensuring that local workers get a fair crack of the whip in council contracts or ensuring that tea and coffee producers in the developing world are treated fairly. I welcome the support for the new policy. It is important to look at fairtrade in the tendering processes. The previous Scottish Executive started the process of Scotland becoming a Fairtrade Nation and this has been continued by the current administration I hope that this will allow us to make our contribution toward Scotland being declared a Fairtrade Nation later this year. I am glad to see support for Fairtrade Fortnight mentioned in this report. Fairtrade Fortnight starts in a fortnight today and in Dundee we will be visited by Masauko Khembo who is a Malwian Sugar Producer. There will be public events at Dundee University on 28th February at 5pm and the McManus Galleries on 29th February at 7pm, everyone is very welcome. As well as events at Morgan Academy. I welcome this report and look forward to the annual report reflecting year on year increases in the use of Fairtrade.